Listening to a recording of R. David Lankes’s “The Faithful and the Radicals” over the weekend felt like going to church. It’s inspirational. Transformative. And steeped in a sense of the divine. It is the sort of plea for community, collaboration, and action that runs consistently from the earliest seminal public presentations of our history through a continuum that includes more recent efforts including Jon Stewart’s speech at the end of his Rally to Restore Sanity in October 2010. Although “Faithful and Radicals” is ostensibly about school librarians, libraries, and the society-shaping roles they play and need to play in the extended communities they serve, it’s really far much more than that. If we are at all interested in the present and future of our communities—and who among us can afford not to be?—Lankes’s thoughts can’t help but touch and move us. He is, as always, funny. (Who else would jokingly threaten to slash the tires on our cars if we spend more time creating booklists and pages full of links to online resources that soon will be broken than fulfilling our potential to contribute to the success of our communities?) Engaging. (The positive reactions to what he says are audible throughout the recording.) Radical (in the complex, multifaceted way that the word “radical” in its varying definitions implies: foundational, rooted, fundamental, and cool as well as extreme). Visionary. 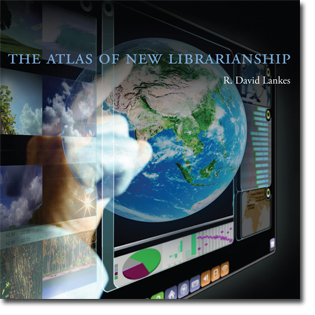 (His proposed mission statement for librarians—“The Mission of Librarians is to Improve Society through Facilitating Knowledge Creation in their Communities”—flows right off the pages of The Atlas of New Librarianship into “The Faithful and the Radical.”) Poignant. And humble. (He actually pokes fun at his own title for the presentation, commenting on how it could serve equally well as the name of a PBS production or a soap opera.) Above all, he’s obviously an incredibly talented teacher-trainer-learner—as I learned while participating in his New Librarianship Master Class (a massive open online course) and writing extensively about it last year. And all of those attributes combine to make him the sort of mover and shaker who keeps the world alive, vibrant, dynamic, thinking, and smiling—which is, in itself, a point worth lingering over momentarily, for it wasn’t at all clear a year ago that he would still be with us. He has openly, painfully, and beautifully, via his blog, chronicled his experiences with Hodgkin’s Lymphoma, and he begins “Faithful and Radicals” by noting that it’s his first major public presentation since undergoing stem cell transplants. But that’s just the backdrop to much of what he accomplishes with “Faithful and Radicals.” His starting point is something every one of us needs to remember: that all of us—regardless of profession, interests, values, and experiences—has moments in which our faith is severely tested and doubts can become overwhelming. With that in mind, he recalls a recent, personal crisis of faith in which he asked himself why he continues to remain part of the group fighting to assure that libraries—and, more importantly—librarians (which, as I’ve written many times before, are our close allies in training-teaching-learning, and vice versa) are supported and that they are active participants in shaping their communities. It’s far more than the oft-quoted mission to support reading, he noted, adding that he actually hates the pervasive libraries-support-reading promotions because libraries and librarians promote so much more that is essential to learning, community-building, and creativity. Nearing the end of his presentation, he doubles back to overtly address his decision to undergo all the brutally awful treatment he has endured. Reflects on what it means to choose between giving up or fighting against a life-threatening disease through potentially lethal treatments. And acknowledge that surrender would have deprived him of the opportunity to be with us long enough to share “The Faithful and the Radical” with us. Reaching the end of that recording, I was left rethinking long-held beliefs about what decision I might make if/when faced with the sort of life-threatening situation Lankes has struggled; I have to admit that what he says and what he does has, in the most significant of ways, served the purpose of great learning facilitation: he made me do some serious rethinking about personal comfort and preferences as opposed to the greater responsibilities each of us has. Lankes could have opted to forego the fight. In a sense, however, he decided to work beyond the shift life had apparently decided to assign him and do some overtime by staying with us. It’s the sort of overtime for which there can be no adequate payment. But perhaps we can do our part in rewarding him by listening. Taking action. Thinking about the need to transcend our own comfort zones to take actions for the greater good of the people, the communities, and the societies that support us. And continuing to stand with those we love and admire through the best and worst of times in the hope that the best remains ahead of us. This entry was posted on Tuesday, April 29th, 2014 at 12:41 pm and is filed under leadership, libraries, training. You can follow any responses to this entry through the RSS 2.0 feed. You can leave a response, or trackback from your own site.